A new study shows that Kineret (anakinra), a medication approved for the treatment of rheumatoid arthritis, is effective in stopping the progression of organ damage in people with neonatal-onset multisystem inflammatory disease (NOMID). This rare and debilitating genetic disorder causes persistent inflammation and ongoing tissue damage. The research was performed by scientists at the National Institute of Arthritis and Musculoskeletal and Skin Diseases (NIAMS), part of the National Institutes of Health. NOMID affects numerous organs and body systems, including the skin, joints, eyes, and central nervous system. The first sign of the disease is often a rash that develops within the first weeks of life. Other problems, including fever, meningitis, joint damage, vision and hearing loss, and mental retardation, can follow. Kineret, one of a relatively new class of drugs known as biologic response modifiers or biologics, blocks the activity of interleukin-1 (IL-1), a protein made by cells of the immune system. IL-1 is overproduced in NOMID and a number of other diseases, leading to damaging inflammation. Previous work by the same NIAMS group showed that blocking IL-1 was effective in relieving symptoms of NOMID. However, this is the first study to show that Kineret works over the long-term and, at higher doses, can also control damage that often results in vision and hearing loss, and brain lesions. “Inflammation prolonged over many years will eventually cause irreversible damage and loss of function,” said lead author Dr. Raphaela Goldbach-Mansky of the NIAMS Translational Autoinflammatory Disease Section. For example, inflammation of the cochlea — a tiny structure of the inner ear — was found to be responsible for hearing loss in people with NOMID. There is a need to analyze tumor specimens at the time of ovarian cancer recurrence, according to a new study published in the February 2012 issue of Molecular Cancer Therapeutics. Researchers used a diagnostic technology called molecular profiling to examine the differences in the molecular characteristics of primary and recurrent ovarian tumors and found significant changes for some biomarkers. This is the first study that examined potential differences in a broad biomarker panel in patient-matched primary versus recurrent ovarian cancers and underscores the importance of analyzing the most current tumor tissue in order to make the most informed decisions about treatment for recurrence. Ovarian cancer is the most deadly of gynecological cancers, and is the fifth leading cause of cancer-related death among women in the United States. Treatment for recurrent ovarian cancer often follows a trial-and-error approach in spite of molecular profiling technologies available to inform treatment selection. Profiling technologies may be utilized at the time of ovarian cancer recurrence, but the tumor specimens that are analyzed are most often those obtained at initial diagnosis. This profiling of the primary tumor does not take into account changes that occur in recurrent tumors, which may have enabled their survival after chemotherapy treatment. Lead author Dr. Deb Zajchowski, Scientific Director of The Clearity Foundation, says, "These results highlight additional challenges for the treatment of recurrent ovarian cancer. The study helps us appreciate the degree to which tumor characteristics that may be useful for making treatment decisions may change over the course of this disease." Dr. Zajchowski, Clearity Scientific Advisor Dr. Beth Y.
Neuroscientists at Case Western Reserve University School of Medicine have made a dramatic breakthrough in their efforts to find a cure for Alzheimer's disease. The researchers' findings, published online on February 9, 2012 in Science, show that use of a drug in mice appears to quickly reverse the pathological, cognitive, and memory deficits caused by the onset of Alzheimer's. The results point to the significant potential that the medication, bexarotene, has to help the roughly 5.4 million Americans suffering from the progressive brain disease. Bexarotene has been approved for the treatment of cancer by the U.S. Food and Drug Administration for more than a decade. These experiments explored whether the medication might also be used to help patients with Alzheimer's disease, and the results were more than promising. Alzheimer's disease arises in large part from the body's inability to clear naturally-occurring amyloid beta from the brain. In 2008, Case Western Reserve researcher Dr. Gary Landreth, professor of neurosciences, discovered that the main cholesterol carrier in the brain, apolipoprotein E (ApoE), facilitated the clearance of the amyloid beta proteins. Dr. Landreth is the senior author of this Science study. Dr. Landreth and his colleagues chose to explore the effectiveness of bexarotene for increasing ApoE expression. The elevation of brain ApoE levels, in turn, speeds the clearance of amyloid beta from the brain. 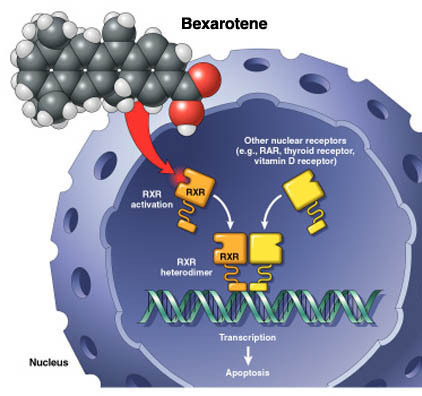 Bexarotene acts by stimulating retinoid X receptors (RXR), which control how much ApoE is produced. In particular, the researchers were struck by the speed with which bexarotene improved memory deficits and behavior even as it also acted to reverse the pathology of Alzheimer's disease.